Unaccountable and unfathomable are the things that take place behind the shroud of darkness we call night. The owlshadow that precedes the small shriek or the stealthshape that rustles the prairie grasses beneath a gibbous moon. These are the things that made the Native Americans don their superstitions and grow old before their time. These are the things that awaken in us, even in our post modern society, musty genetic memories fraught with what we used to be and whence we have come. Sometimes I awaken in the middle of the night, in times of the changing of the seasons or in periods of unremembered dreams, and I lay silent and still, the child in me mindful that movement or even breath may give away my presence to the nightwatchers. Camping in strange country, sleeping on the bones of unknown species, gleaning unfamiliar sounds stirring on the night wind. These things bring us, with equal parts apprehension and wonder, to the edge of our origins, reluctant to turn and start down the dark path that disappears in the opposite direction. Bob Gress, Director of the Great Plains Nature Center in Wichita, has preceded me into the blind. Tallgrass Prairie born, raised, and educated, Bob knows its denizens intimately and has photographed them more beautifully and evocatively than anyone. He has brought me to this piece of high ground overlooking the heart of the vast Flint Hills of eastern Kansas to experience one of the strangest and most fascinating spectacles in the avian world, the annual springtime courtship ritual of the Greater Prairie Chicken. Bob is already dozing as I settle, in complete darkness, into my corner to await the arrival of the males to the lek just in front of our blind's viewing ports. I am the acolyte here to Bob's prairie priest, his experience covering many such mornings over many Aprils. This is my third try at Greaters over the years, the first aborted by tornado, that nemesis of springtime on the Kansas plains, and the second by a bone chilling cold front that sent temperatures in northern Missouri plunging into single digits. Chickens arrive on the lek at first light, but their perception of first light is much keener than ours. I cannot see my hand in front of my face but my ears detect the arrival, their "song" at first barely discernible over the prairie wind as if in some eternal darkness their spirit has escaped our visual sense, leaving far behind any actual embodiment of bone and beak, feather and claw. This song is called "booming," but it is not booming. It is soft but resonant, hollow yet somehow whole. It is eerie and mournful. It is outside any human experience, any sensual reference, any worldly context. The sound most closely resembles determined blowing across the mouth of an empty bottle, but who would blow across an empty bottle in pre-dawn darkness on a cold Kansas prairie devoid of human presence? It is the unremembered dream. It is in our genetic coding without our cognitive acceptance or understanding. Bob stirs as the differentiation between land and sky becomes a reality in the faint glow along the eastern horizon. The cameras are set up on the tripods, ready to shoot, but digital sensors are as inferior to our eyes in their light gathering capacity as our eyes are to those of the chickens. Dawn is not sunup. Bob has situated the blind perfectly, the sun directly behind us, but it will be upwards to an hour before either species here detects actual sunlight. This is a good thing. It gives time to savor the ancient scene playing out before us before we begin to film the dance. And, in this new digital age, I remember I must now use the word "capture" rather than "film." We count, tentatively in the half light, six males on the lek. No, maybe seven. Is that a different one just over the rise? That would make eight. One is across the tractor trace to the right. One is far out to our left in taller grass, passing in and out of sight as we contort to see 180 degrees through the small viewing portals. There is no doubt the three males directly before us are the main players on this stage. We know it as surely as will the females who have yet to appear in the scene. 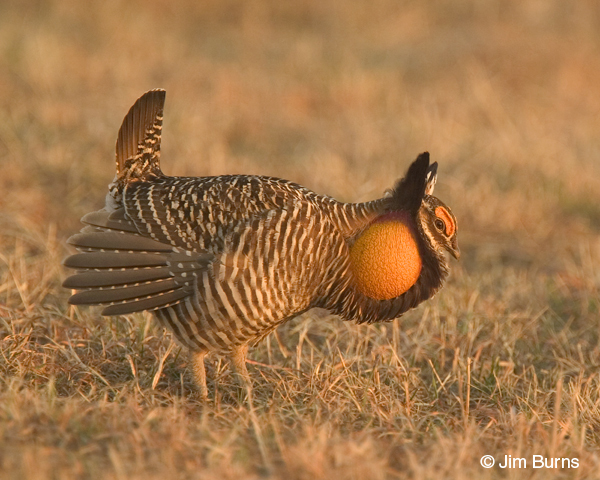 In the prairie chicken world, it is the females who decide. If the "dance" we are witnessing seems bizarre, a word often used to describe it, the concept itself is not, for it plays out much as it might in our own world, the hottest female gravitating to the center of the dance floor where the male with the best moves commands all eyes. She chooses him, not he her, and she often leaves with him, the males on the periphery left to await perhaps another year until maturity and experience place them at center stage. 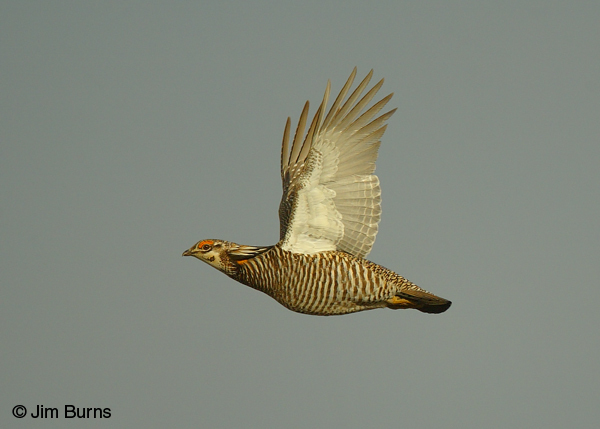 As the light intensity grows, so to does the intensity of the males on the lek. We watch in wonder as the closest male transforms before our eyes from a drab, passive, upright creature well camouflaged as a clump of prairie grass into a horizontal dervish, neck pinnae extended, orange eyebrows protruding, yellow-orange esophageal air sacs on his neck pumping with each "boom." He fans his tail, he leaps straight up, he spins, he makes a run at the male on the next territory, stops, spins again, bows, arches his wings, all the while stamping his tiny feet on the hard prairie soil. Knowing Native Americans of the Great Plains took many of these rituals for their own, then seeing the original choreography produced by an original troupe brings a strange, unsettling time warp. If art imitates life, Bob and I are spectators at a little used window on real life, the species before us keeping it real, our species doing all it can, if only by default, to allow that window to close, that reality to lapse. And then we will forget and we will embrace the Native American art form as our only remembrance of what we have lost and forgotten. Suddenly there is an upswelling of sound, hollow booming overlain by sharp cackling and the frantic beating of wings. Over the chickens' din Bob hisses the word "female." She appears far out on the left, walking with regal gait, disdaining to even hesitate near the lowly male out on the margin of the lek. She comes toward the blind, veers off to the left, then crosses center stage, reaches the two-track, and walks on down the lane of flattened grasses, seeming to intentionally intersect the territory of each of the displaying males. Occasionally she stops to peck at the ground or glance around, at which point the nearest male rushes toward her, hopeful, but she gives no hint of notice to any of the ardent suitors. Bob suggests in whispers that copulation may still be a couple weeks away. He has seen it only a few times. The chickens, like most birds (and most of our species) make it quick. I am reminded of the "Wham, bam, thank you ma'am" line from the old joke. I ask Bob if he has ever photographed it. He rolls his eyeballs and shakes his head "No." As the hen disappears over the small rise to the west, we are as disappointed as the strutting males. A soft luminosity suffuses the prairie now, and pulsing air sacs begin to glow an incandescent orange. Startled from our tracking of the hen, we realize the sun is up. Through the back portals we watch as the round fireball clears the eastern horizon and changes from red to orange to yellow before our eyes, at one point perfectly matching the color of the chickens' inflated air sacs. Gloved hands scramble for shutter buttons. Typically the greatest chicken activity occurs just after sunrise. There is a rush of sound, then the flutter of wings and the booming and cackling cease in a sudden silence. As we turn back to the front portals we see chickens taking to the air in every direction. A Northern Harrier wafts low along the periphery of the lek, tipping, wavering, banking as Northern Harriers do. Bob notices my look of consternation and counsels patience. He is sure the players will return shortly. He has never seen a harrier take a chicken, but has heard stories from lek watchers who have. And he is right. One by one the males fly back in, ready to resume the performance. In the strengthening light we now see that the upper and forward margins of the esophageal sacs are not orange but raspberry, and the surface of the inflated sac is indeed wrinkled and textured much like that of the citrus fruit whose color it imitates. The neck feathers that form the pinnae point skyward above the head at full extension, their black on white interior pattern like stained glass steeples paying homage to the eccentric playwright whose purpose in creating this bizarre performance we cannot divine. Tiny puffs of dust rise from the prairie floor where tiny feet keep cadence to indiscernible hormonal rhythms. Shutters fire in rapid, random bursts in our poor attempts to capture some essence of this undecipherable prairie dialect. And then it is over. Meadowlarks are singing and gathering nesting material but, as no other hens appear and the mid-morning heat rises, the male chickens lose interest in their mock fights. They begin to feed, picking here and there on the ground within their lek territories. Finally one takes flight. It is the awaited signal. Another takes flight. Then the rest jump to wing in unison. Frantically I swing the lens to follow. Absurdly lucky, I capture one flight frame in perfect focus. It is over. Bob and I look at one another grinning. Finally warm after the cold dawn, but stiff from our long confinement in cramped positions, out of habit we begin to converse in whispers though the chickens are gone and will not return in daylight. We load the truck. Bob starts the motor. Then a flash of intuition bubbles up from the depths of long unexercised DNA, leaping some synapse between two ancient species now long divergent on this Kansas prairie. I jump from the truck, run to the lek, and drop to my knees, searching. Searching for something I have never known. Perhaps this is the unremembered dream. This lifetime slips away. Centuries turn into eons. I am outside my personal experience and perception now, but still within the realm of my species' history. Back in a time when our ancestral trees, both the grouse and mine, had fewer limbs. I find them, two small feathers striped white on brown, blowing, but caught up in the prairie grasses. One I toss skyward where it catches the west wind. The other I slip carefully into a pocket, a memento of a time when we were all in this together, all children of the west wind.